Peter started working for the NHS as an apprentice gardener when he was just 15 years old. Peter is now 62 years old and will be retiring next March, shortly before his 63rd birthday. During his career, Peter has worked across all hospital sites to make outside spaces more pleasant. Peter was put forward for this accolade by his wife Janis and Geraint Davies, Building Manager at Cardiff and Vale UHB. Janis said: “I would like to tell you about my husband Peter Sansom who started working for the NHS at 15 years of age as an apprentice gardener. “I know the Health Board has many long serving members of staff, but I think it is unlikely that there are many grounds or garden staff who have completed 47 years working outdoors. “Peter loves his work and is so proud of all that he has achieved at the Health Board during the past 47 years, I’m sure he’ll greatly miss the patients, staff and his colleagues. Geraint Davies, Building Manager at Cardiff and Vale UHB said: “Peter has worked for the Health Board for almost 47 years. “Peter started as an Apprentice on 17 March 1972. “Peter became Head Gardener for the Health Board in 1996, and has worked tirelessly to improve the green spaces at all sites across the Health Board. “During his career Peter has been responsible for maintaining and improving the hospitals grounds and gardens, and in his early career his duties included growing vegetables to feed the patients and flowers for the hospitals wards. “Peter is a true gentleman, and always puts the patients first. “Peter takes pride in his work, and is always on hand to assist with a smile on his face. 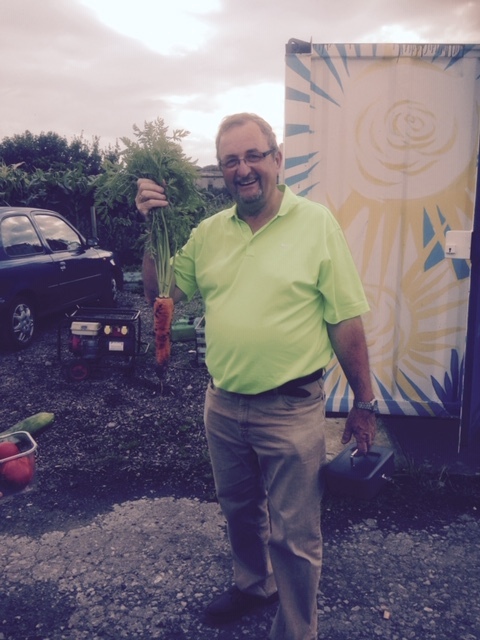 “Peter is a keen gardener outside of work, and is well known for his home grown pickled onions, homemade jam and home grown vegetables which we will all miss!